Computer Scientist turned gay activist turned Parliamentarian, Sunil Pant, is the founder of Pink Mountain Travels and Tours. He’s spearheading the effort to make Nepal a gay-friendly tourist destination, and he’s pressuring the conservative Hindu nation to legalize gay marriage. 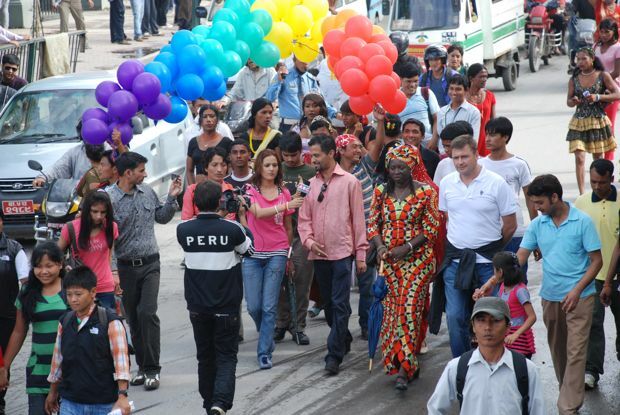 “I believe Pink Mountain’s contribution will prove to be significant not only in making the “Visit Nepal 2011 campaign” a grand success but also in bringing this lucrative gay and lesbian tour market to Nepal and building Nepal’s economy into something strong. This will also generate jobs for the marginalized LGBTs in Nepal,” Pant says. The backstory on this is that gay marriage is not quite legal yet in Nepal, though authorities have given unofficial permission and there is widespread support for its legalization. Pant has been campaigning for several years and his frequent protests and hunger strikes are intended to get Nepal’s lawmakers to finalize the legislation. But like with other legal matters, the country is slow-moving, especially with the country’s persistent lack of a cohesive, functioning government. 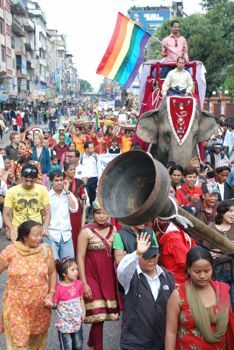 But Pant certainly knows how to shake things up–a recent gay pride parade he lead also coincided on Nepal’s holy day of Gaijatra (pictured above and at right). So while Pink Mountain is meant to be a facilitator of gay marriage in the country, it also seems that the move is another way to place pressure on the government to legalize gay marriage, and Pant’s tactic this time is to appeal to economic interests in the form of tourism. “Hope our valued guests, LGBT visitors from around the world, will have an amazing time in this inclusive, interesting and mystical country,” Pant says.